Holub's Golden Weaver, Range-change map between SABAP1 (1987-1991) and SABAP2 (2007-current). 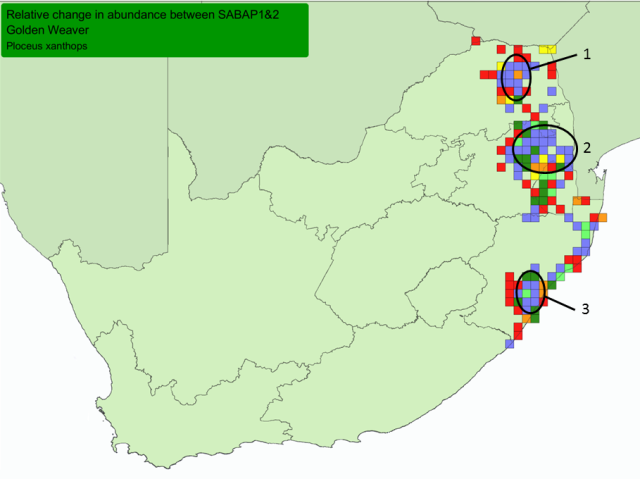 In South Africa the Holub's Golden Weaver has many more grid cells with increases in reporting rate than cells showing decreases, between SABAP1 (1987-1991) and SABAP2 (2007-). 2. Mpumalanga, centered on Nelspruit (also the core of its range in South Africa). On the edges of its range in South Africa, particularly around the areas of high increases in Limpopo (no. 1) and the western edge of the KwaZulu-Natal midlands (no. 3).